Surprise! That’s what our reaction was to the volunteer annual ryegrass growing in our fields nearly 18 months after they were sown. Almost two years to the day I posted an article about Killing Tall Annual Ryegrass. The problem of a wet and chilly 2011 has resurfaced an ugly head to be a wet and COLD spring of 2013. But over the past week or so temperatures have warmed into the 70’s and 80’s with cover crop annual ryegrass and winter cereal rye having grown tall in some areas of the Midwest. 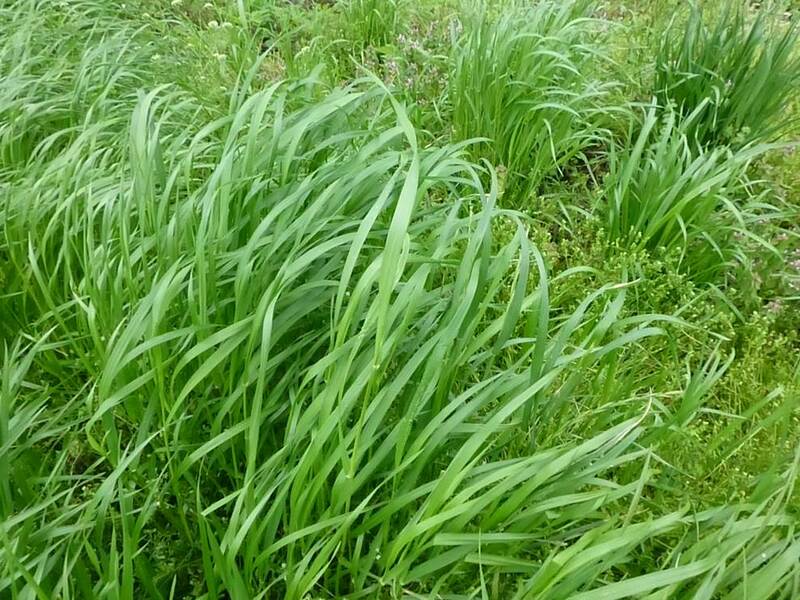 Producers need to kill their cover crops as soon as possible to comply with RMA regulations. What about the surprise cover crops? In a previous post I wrote about dormant seed in cover crop species on our home farm. I showed how radishes were present in soybean fields and how annual ryegrass was coming up even after there was residual herbicide and burndown herbicide applied. Now here we are in the spring and we have a few new surprises. 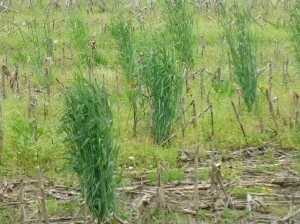 Fall 2011 planted annual ryegrass and even fall planted winter cereal rye are now growing in the spring of 2013. These cover crops were fully terminated in the spring and summer of 2012; there was effective weed control. So dormant seed has germinated and now grown a full 15-18 months after it was seeded. So yes, cover crops can become weeds. We have the benefit of a “thin” cover crop and we did not have to pay seed cost or application cost for the second year. In our farming situation it is not a big deal. We terminated all of our cover crops and weeds with a “hot” chemical mix. It is a mix similar to what we used in our no-till fields prior to glyphosate coming on the market. However, if we were growing wheat or oats or barley for grain and straw it could be a problem. Thankfully there are now chemicals to use in cereal crops to eliminate annual ryegrass. 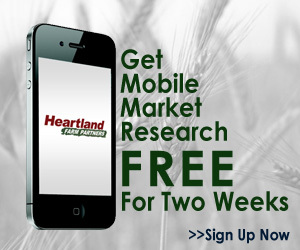 I hear reports that Jamie Scott from northern Indiana has seen excellent results with this practice. We have less winter annual weeds where we have the “volunteer” cover crops and I’m confident our soil health is better where we have the cover crops. We enjoy the benefit that we have from the cover crop (even though it is a sparse stand) and we watch to make sure we do not have any cover crops coming back before harvest. The cover crops are now dead and a residual herbicide is applied. Now we wait to plant the corn and soybeans and scout for any additional dormant seed to germinate and grow. A clean harvest is important to all producers. Our goal is to use the information from our own farm to make sure that farmers understand the rewards that cover crops bring and also the risk that comes with the reward. The risk is not huge and it is manageable, but it is risk none-the-less. This volunteer annual ryegrass was terminated before heading out but it was jointed and would have made a great forage crop. 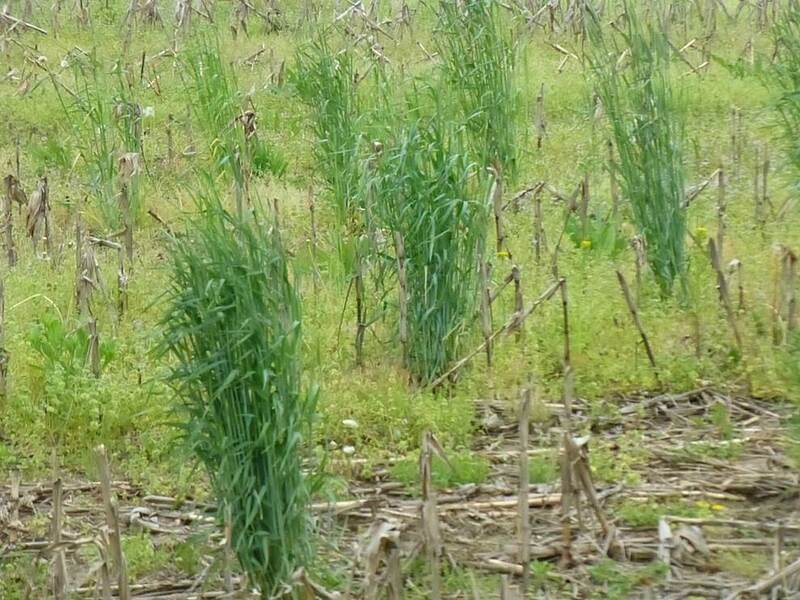 Volunteer Winter Cereal Rye was also growing in the old plot area. The cover crop was terminated well before the corn will be planted. Great article once again. I have one question I cant seem to get a good answer to. What happens with annual ryegrass if you dont kill it? Can you graze it all summer long?Does it stay palatable for cattle? Will it reseed itself year after year. We love the stuff for fall and spring grazing. We plan on planting it again on some ground this fall and then this ground will become permanent pasture next year. Thanks again. Great job. Hi Chris! The annual ryegrass that overwinters will go to seed head in May/June. After it goes from vegetative to reproductive the forage quality drops considerably (from dairy quality to nearly that of straw as it matures). Unfortunately it rarely goes back to the vegetative state. 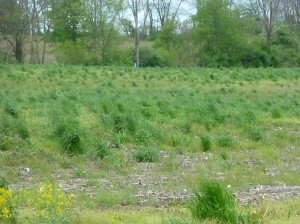 If you look at the University of Kentucky annual ryegrass forage trials you will see that fact. (Usually their first harvest is in the vegetative stage so they get a second harvest in June but the July-October harvests are nearly zero yield.) Unfortunately it will reseed. I say unfortunately because unless you want to always keep that land in pasture or hay production for many years you will build a tremendous seed bank of ARg seed and it will most likely create management issues for row and cereal crops in the future. The goal with cover crop ARg is to enjoy the benefits it brings…then kill it as early as you can in the spring!